To mark the official launch of my book Scientific and Technical Translation Explained, I will be giving a workshop on technical translation at the Irish Writers’ Centre in Dublin on 20th October. 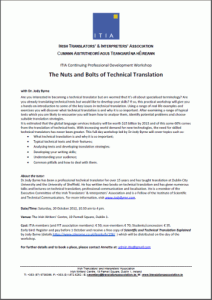 This workshop is part of the Irish Translators’ & Interpreters’ Association’s continuing professional development series and will give participants a hands-on introduction to some of the key issues in technical translation. Common pitfalls and how to deal with them. For details on how to register, visit the ITIA website. My PowerPoint presentation from this workshop is now available here.